Humboldt Bay — Perch Road, King Salmon, Dec. 13, 2012. The next king tides begin Dec. 31 with a high tide expected to be a foot higher than the average high tide, says the release — and the highest high tide in 2013 (at the North Spit tide gage, for instance, the tide is expected to rise to 8.56 at 10 a.m). They’ll spill over (ha ha) into the new year on Jan. 1 (with an 8.65 tide at 10:52 a.m. at the north Spit gage) and Jan. 2. Your “images will help document flooding, erosion and levee breaches that we are likely to face with increasing frequency as sea level continues to rise,” says the release. All you need is a camera or smartphone. To adopt a site to document, email KingTidePhotos@gmail.com. 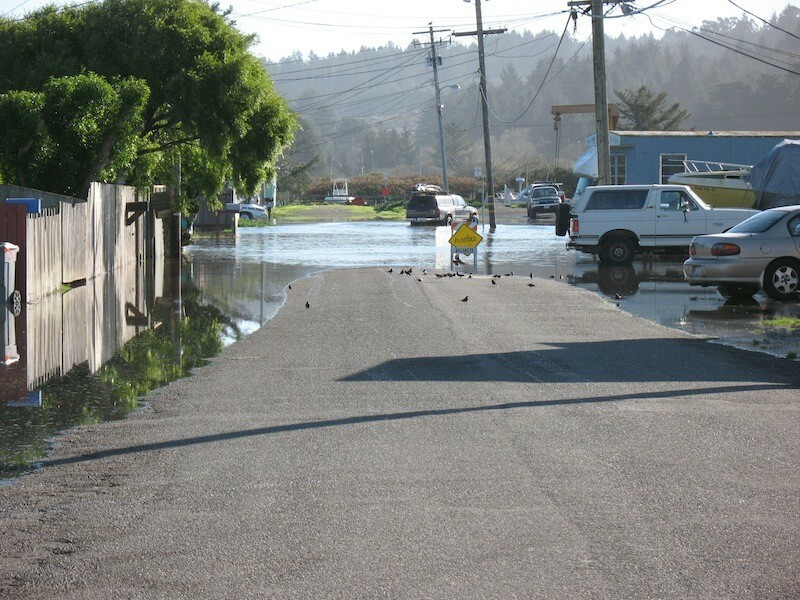 Your pics will go up online (check out 2012’s King Tide Photo Initiative entries). Baykeeper’s Jennifer Kalt’s recommended king tide observation spots don’t include Eureka Slough Bridge — gotta admit it’s a scary, traffic-zipping spot, but the king tide there Monday will be 9 feet, and on Tuesday, Christmas Eve, 9.24 feet! They do include Halvorsen Park and the F Street boardwalk in Eureka, Woodley Island, the Mad River Slough Bridge on Highway 255 in Manila, Liscom Slough on Jackson Ranch Road in Arcata, Fields Landing and King Salmon. And of course you should check out NOAA’s tide predictions. As ever, use your noggin on this adventure and be careful. For more info on high tides, sea level rise and Humboldt Bay in particular, check out Humboldt Baykeeper’s sea level rise site; the Humboldt Bay Harbor, Recreation and Conservation District’s Humboldt Bay Sea Level Rise Adaptation Planning Project and our profile of the man who walked around the bay and meticulously documented its shoreline and its vulnerabilities, Aldaron’s Walkabout.